On November 11, 1972, the Kansas City International Airport officially opened for commercial service. The airport replaced the existing Mid-Continent Airport at the same location. Twenty years before, the 1951 flood destroyed many Fairfax Airport facilities on the west side of the Missouri River and compromised operations at the downtown Municipal Airport. With the area’s two main airports shut down, Kansas City began planning a new airport 20 miles north of the flooded city. Opened in 1956, Mid-Continent Airport served as a hub for Braniff Airlines and boasted Trans World Airlines’s (TWA) main overhaul base, but the runways and terminals remained undersized to serve as Kansas City’s main airport. Most passenger traffic to Kansas City continued to land at Municipal Airport, where large, fast jets had difficulty landing on the small runways and taking off without hitting the skyscrapers. In hopes of increasing flight capacity in and out of the city, TWA encouraged the expansion of Mid-Continent Airport. Proponents of the expansion thought Kansas City had much to gain from a new airport, especially considering the city still had important ties to TWA, which originated in Kansas City in the 1930s, employed more workers than any other business in town, and was among the most prestigious airlines in the world. Built at a cost of $250 million, the ambitious airport design drawn up by the architectural firm Kivett and Myers reflected TWA’s grandiose ambitions. In land area the airport was the third largest in the United States. It featured an innovative “Drive to Your Gate” design in which each circular terminal allowed passengers to park nearby and walk roughly 75 feet to their gate. Only flat farmland surrounded the airport and flooding posed no risk on the high plateau, making it a practical location for large new jets such as the Boeing 747. Less convenient were the 20 mile drives into the city and the security checkpoints required at each cluster of gates rather than one for the entire terminal. Another drawback was that TWA had already relocated its central U.S. passenger hub from Kansas City to St. Louis during the 1960s, which reduced traffic through Kansas City. 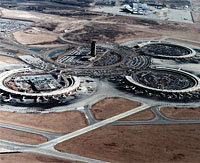 Although several of these flaws restricted the airport’s enormous potential, all agreed that it was a unique design and a source of local pride when it opened. Today the Federal Aviation Administration considers the airport to be mid-sized in terms of passenger traffic and still among the largest in the country when measured by usable acreage. In addition, the old TWA overhaul facility still provides nearly 800 jobs and now maintains aircraft owned by American Airlines, which bought out TWA in 2001. Correction:The original version of this article incorrectly stated the date of KCI's public opening as November 21, 1972. The error has been corrected. Read the full biographical sketch of Clarence Kivett; architect whose firm, Kivett and Myers, designed the Kansas City International Airport’s terminals, control towers, and administrative building, prepared by Susan Jezak Ford, Missouri Valley Special Collections, The Kansas City Public Library. A Century of Kansas City Aviation History: The Dreamers and the Doers, by George R. Bauer; contains information and illustrations covering all eras of aviation in Kansas City. Aviation History in Greater Kansas City, by Cub Flyers Publications. When Dreams Take Flight: Celebrating the History of Aviation in Kansas City, by Ingram's Magazine. TWA: Kansas City's Hometown Airline, by Julius A. Karash. High & Rising: The 1951 Kansas City Flood, by Brian Burnes; contains information on the flood at Municipal Airport, the Fairfax Industrial District, and the subsequent construction of the Mid-Continent Airport, pp. 82-89, 117. Visit the National Airline History Museum, Hangar 9 at the Kansas City, Missouri Downtown Airport, 201 NW Lou Holland Drive, Kansas City, Missouri 64116, (816) 421-3401. You can also visit the TWA Museum, 10 Richards Road, #110, Kansas City, Missouri 64116, (816) 234-1011. George R. Bauer, A Century of Kansas City Aviation History: The Dreamers and the Doers (Kansas City, MO: Historic Preservation Press, 1999), 34-39, 121-130. Brian Burnes, High & Rising: The 1951 Kansas City Flood (Kansas City, MO: Kansas City Star Books, 2001), 82-89, 117. Dory DeAngelo, What About Kansas City! : A Historical Handbook (Kansas City, MO: Two Lane Press, 1995), 72. Julius A. Karash, Rick Montgomery, and Doug Weaver, TWA: Kansas City's Hometown Airline (Kansas City, MO: Kansas City Star Books, 2001), 40-50.